We are big fans of this actor here at Chisholm’s Trail and really enjoyed the movie “You Know My Name.” This made for TV western in 1999 brought to the screen the final chapter of Marshal Bill Tilghman’s life. Matt Braun wrote the novel “One Last Town,” which this movie was based on. Early in his career Bill was acquainted with other lawmen such as Wild Bill Hickok, Bat Masterson, and Wyatt Earp. As a deputy US Marshal, Tilghman made his career bringing law and order to the Indian Territory. He became one of the famous “Guardsman” of Oklahoma. This included Heck Thomas and Chris Madsen. Tilghman also tried his hand at movies in 1915, when he co-wrote, directed, and starred in the western “The Passing of the Oklahoma Outlaws.” (if any of you reading this post know where I can obtain a copy of this film ~ please contact me). 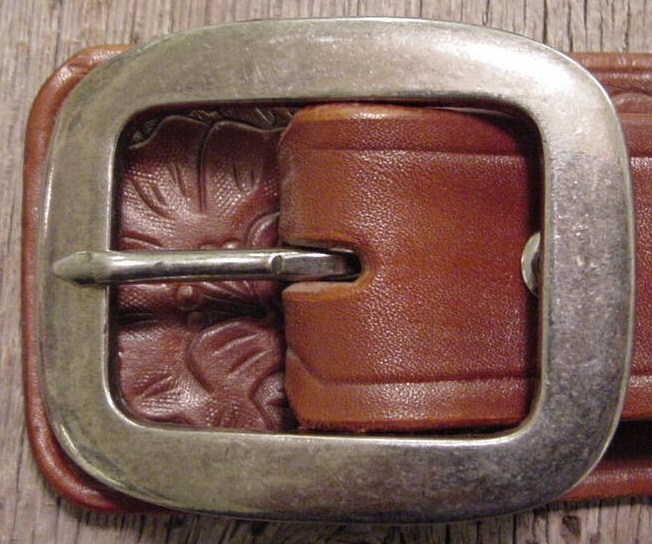 Tilghman continued to wear a Western Leather Holster his entire career. When Bill was 70 in 1924 he was convinced to take the position as marshal of Cromwell, Oklahoma and clean up the out of hand criminal element. It was surprising to me that cocaine and heroin were as available as cigarettes at that time. On November 1, 1924 he was shot by a corrupt Prohibition Agent by the name of Wiley Lynn. What most folks don’t know is that he was dying of terminal cancer at the time and kept his pistol in his vest pocket because his Western Leather Holster and gun belt hurt him so much to buckle on. We owe a debt of gratitue to current Deputy Marshal Steve Carson for encouraging us to research the life and locations in which Bill Tilghman served. We found that the folks that made the movie had interviewed many of the same people we did. The rig Sam Elliott wore in the move was as correct as research can prove. 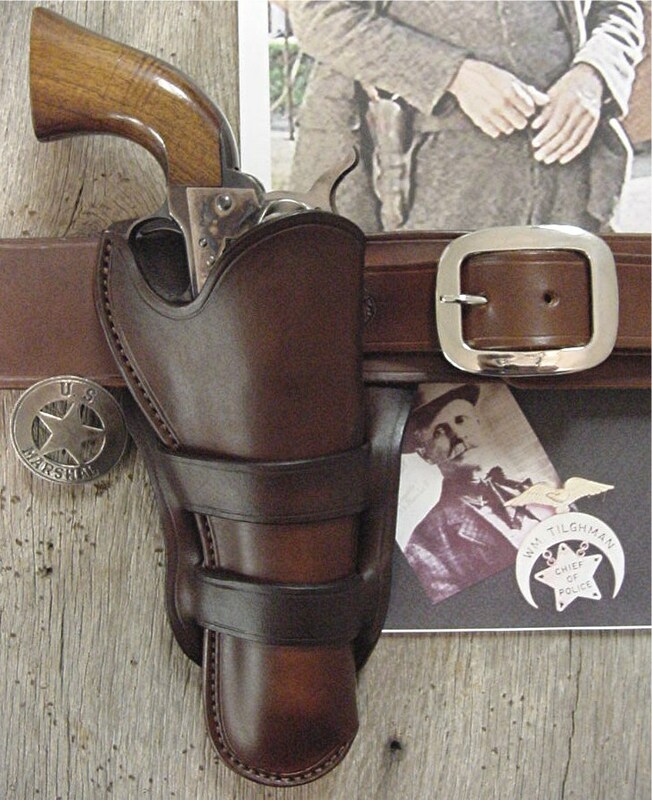 We have diligently tried to reproduce this holster, gun belt, and buckle for your enjoyment. Donna and Alan, Owners of Chisholm’s Trail found Bill’s working Colt Single Action Army in the Davis Historical Museum in Claremore, Oklahoma. It was a plain blue 5 1/2″ barrel gun with faded cocoa brown checkered factory grips in caliber 38.40, with a serial number of 235639. Tilghman’s fancy (BBQ) gun we found in the Boot Hill Museum in Dodge City, Kansas. The curators were kind enough to remove this gun from display and allow Alan To examine and hold it. The pistol is a beautiful, engraved, nickel plated, mother of pearl stocked Colt Single Action. This entry was posted on Sunday, February 13th, 2011 at 5:15 pm	and is filed under Uncategorized. You can follow any responses to this entry through the RSS 2.0 feed. Both comments and pings are currently closed.